I started this little excursion to Salt Creek Beach in Dana Point California with the intention of just ripping through a couple Dji Mavic Batteries and heading out with a 15. However, the ocean was very well exposed and the waves were overhead at least! The whole area has a unique feel as the south end is south facing and the north end is north facing, which for a cinematographer leaves a lot up to the imagination with the lighting schemes. I oddly found the exposure on the whole area to be perfect with my polar pro ND 32 for the Mavic. Although it was kinda a hike down and the parking lot can sometimes be “sketch”, I pretty much took everything down with me for the day and made a video fest out of it. Starting with the Mavic Pro (My Go To for travel video productions) I took up on the “grassy knoll” that sits overlooking the whole area. I have to say, I liked the birds eye view from there and had a lot of control over directions as well as my return to home. Lots to see and the Ritz Carlton kinda gives it some shimmer in that area. Lots of custom built yachts around as well. Using the Polar Pro ND 32 I locked my shutter down at 50 and had no issue what so ever with the exposure. For anyone that doesn’t use ND filters and lock your shutter down, might be something to look into. It really makes a world of difference. Polar pro by far makes the best filters to date that I have used, however I have recently heard TIFFEN is coming out with their versions which will probably be more pricy then they are worth. Note: Set on Manuel, also you can switch to cinema mode as well to get a slower rendition of your shots similar to the shots you see in this video. I generally travel with my Lumix GH5 with a small side of GO PRO HERO6. However, I don’t use the go pro much since the picture quality is far inferior to the GH5. But sometimes I find myself in situations where I can use the GO PRO in accordance or filming the GH5 on the slider, so I bring it just incase. Or…Incase I decide to get wet. Slider cinematography shots in the intro of the video were done on the Cinetics 3Axis slider which is my go to for travel as well. It comes with extensions (which I never use) but always a nice padding incase the unexpected happens. The cinematography always looks amazing and its nice and smooth if you have a light setup. My GH5 with the Canon 24-70 L-series makes it a heavy mess, but thanks to “warp stabilize” in Premier Pro, I can always smooth out the bumps. 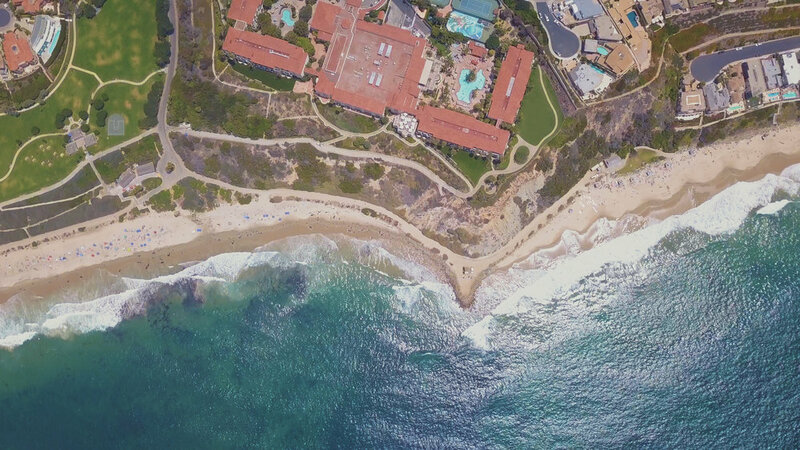 Salt Creek Beach is located right next to The Ritz Carlton Laguna Niguel. The address is 1 Ritz drive in Dana Point with the nice sized public parking lot right across from the amazing hotel. There is a large parking lot that does get full on a warm summer day, so we recommend arriving early although you can generally find parking when people leave. There are parking meters that accept Visa and Mastercard for parking. (Don’t forget to put the parking ticket on the inside of your car windshield.) Salt Creek Beach Park is a popular Orange County park located in Dana Point, CA. This wide sandy beach is directly below the Ritz-Carlton Laguna Niguel beach resort, the Ritz Cove gated development, and the Monarch Beach Golf Links golf course. Salt Creek flows through the beach sometimes at the north end of the beach and on the other side of the creek is the private Monarch Bay Beach Club. Salt With nearly a mile or so of sand spread along the coast just north of Dana Point, Salt Creek Beach is a favorite place for beach visitors to spend the day. For surfers, it is one of the best spots in the area ever since the harbor and accompanying breakwaters at Dana Point changed the surfing geography.Tide pools and California's largest kelp forest just offshore are some of the features that attract visitors to Salt Creek Beach. The area is part of the Niguel Stare Marine Conservation Area. Dana Strand Beach is a public beach at the base of a gated housing in Dana Point called “The Strand.” These are beachfront and hillside homes just north of the Dana Point Headlands that face southwest. The beach here is a nice sandy sunbathing spot that is also popular with surfers. To get to Dana Strand Beach, turn west onto Selva Road from Pacific Coast Highway (Hwy 1) and park in the large parking lot signed “Salt Creek Beach Park.” At the center of this lot is a fenced-in path and stairs that meander downhill between the homes to the beach. Once you get to the beach there is a boardwalk that makes it easy to walk north or south to other spots. There is a funicular (small slow tram) at the north end of the parking lot for those that can’t hike down. North of the funicular the beach narrows in front of the Niguel Shores neighborhood. If you walk north around the point you’ll get to the main part of Salt Creek Beach. You’ll find excellent tide pools at the point on your way if the tide is low. Another access to Dana Strands Beach is a switchbacking concrete path that begins just past the gated entrance to The Strand. Street parking is available at this access.